FILE - The U.S. Supreme Court building is pictured in Washington, D.C., Dec. 15, 2016. The Supreme Court ruled 5-3 Tuesday that immigrants detained by the government and facing deportation do not have the right to a bond hearing. Such hearings determine if a person can be released while awaiting trial in exchange for posting money or property as a bond. If the person fails to appear in court, he forfeits the bond. The decision also affects asylees and permanent legal residents, who can now be detained indefinitely until they have an immigration court hearing. "Today's decision means they can't apply for bond while they are waiting for their day in immigration court," Stephen W. Yale-Loehr, a professor of immigration law practice at Cornell Law School in Ithaca, New York, told VOA. Yale-Loehr said the current backlog for immigration hearings is almost two years. This decision, he said, is "bad news" for immigrant detainees. "More [immigrants] will be detained longer without the right to apply to be released on bond," Yale-Loehr said. "Today's decision impacts detained noncitizens' constitutional rights and their ability to exercise their legal rights during deportation proceedings." A Department of Justice spokesman, Devin O’Malley, said the Supreme Court's action will change a lower court legal interpretation that resulted in "unnecessary bond hearings" that were placing and "extraordinary burden" on the immigration court system. In a written statement the DOJ said it is implementing "common sense reforms" to reduce the backlog of immigration cases. The decision reversed the 9th U.S. Circuit Court of Appeals, which said detained immigrants have a right to a bond hearing every six months while they are being detained. Justice Elena Kagan recused herself from the case. She was solicitor general in the Obama administration when this case was argued in the court. According to NPR, the Supreme Court was deadlocked on the case before Neil Gorsuch joined the court. 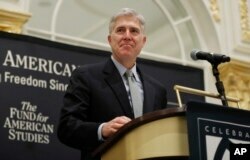 FILE - Supreme Court Justice Neil Gorsuch speaks at the 50th anniversary of the Fund for America Studies luncheon in Washington, Sept. 28, 2017. In Jennings v. Rodriguez, the case's lead plaintiff, a legal permanent resident, pleaded guilty of misdemeanor possession of a controlled substance at age 24. The plaintiff was detained for three years. He was also convicted for joyriding as a teenager. "The 91-page decision included a 33-page impassioned dissent by Justice Stephen Breyer, who read his dissent from the bench — a rare event," Yale-Loehr said. Christina M. Fialho, executive director of Community Initiatives for Visiting Immigrants in Confinement (CIVIC), thanked Breyer in a statement for his passionate dissent and called the decision "a dark moment in our nation's history." "We are appalled by our nation's highest court. Rather than uphold the Declaration of Independence, the Supreme Court has decided to look the other way and uphold a 'legal fiction,' as Justice Breyer called it," Fialho said. According to the Transactional Records Access Clearinghouse at Syracuse University in Syracuse, New York, there are more than 667,000 cases pending in immigration court, with an average backlog of almost two years. The Trump administration has asked Congress to increase funding to detain more immigrants. Today's decision came after a rule published in the Federal Register amended the Executive Office for Immigration Review (EOIR) regulations relating to the organization of the Board of Immigration Appeals by adding four board positions for a total of 21 members. A U.S. Department of Justice spokesperson said on background that DOJ is working to reduce the immigration backlog by half in 2020. This story has been updated. An earlier version inaccurately characterized the quote by DOJ Spokesman Devin O’Malley. Aline Barros is an immigration reporter for VOA’s News Center in Washington, D.C. Before joining VOA in 2016, Aline worked for the Gazette Newspapers and Channel 21 Montgomery Community Media, both in Montgomery County, Md. She has been published by the Washington Post, G1 Portal Brazilian News, and Fox News Latino. Aline holds a broadcast journalism degree from University of Maryland. Follow her @AlineBarros2.